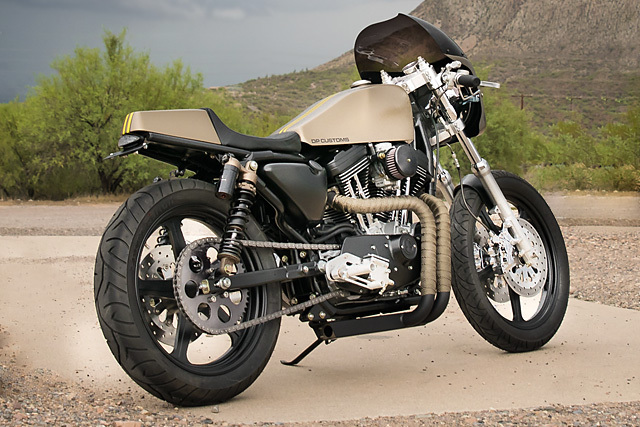 Arizona’s Del Prado brothers, long-time Pipeburners and well known metal pornographers, have just dropped another killer build into our laps – this time in the form of a gold, caféd Harley Sportster. With so many sweet builds to have already graced our humble pages, it’s hard to know what to say about the brothers that hasn’t been said before. They are clearly prolific to the point of obsession and inspired like a master artist. But there’s one other thing that’s also a certainty; they know their way around a hog almost as well as William and Arthur themselves. And here’s proof. Meet ‘56’.